Saturdays are Makerbot Madness. If you want to see the future of 3D printing, it’s a good time to come down. This week, Nick Burrows brought by his bot and his Sarrus Linkage, It was the first time I’ve seen a real one, and although we have a ton of shop projects already, I really want one now. Smooth linear motion with no guide rods. Pure awesome. The LearnMakeCupcake crew and the RHS TEC club also showed up to work on their makerbots. LMC is learning to build, tune and use their machine, and Ben is working furiously to build a mendel for as cheap as humanly possible. Ben’s CupcakeStrap is making some good progress, and he showed off his new extruder mod, based on a paxtruder, but with a gigantic stepper from a printer. It’s amazing what you can scrap together with a little ingenuity and time. This 3D printer has cost somewhere around $300 so far, witth most of the money sunk into electronics. Once it is up and running, they’re going to build up a Mendel and scavenge the strap for the parts. It doesn’t have to be pretty (although I think it’s awesome since it’s made of so much scrap), it just has to work well enough to get them to the next step. PP prints best on Polyethylene (we used an Ikea cutting board). 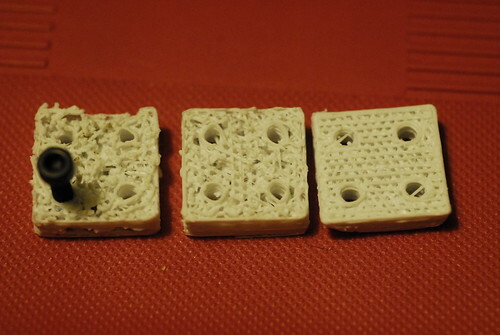 Our first two prints were too hot and fast to produce a good result. The filament bubbled and separated and had a finish like cottage cheese. It didn’t stop us though, and by the third print, we were getting a clean but warped part. (this is a mendel circuit-board-spacer-m4_2off for those of you wondering). All were solid enough to use, and dimensionally correct in hole and spacing. Other than the warp, which we can likely eliminate with heat, the last one didn’t even look bad. This stuff is strong, printable and dirt cheap. We were wondering what it was originally produced for to make it so cheap, and I now think I know the magic google words. Be careful with those words though, there’s a lot of horse and deer fencing out there that’s polyamide 6. That means nylon, and as far as I know, that’s untested grounds. Definitely worth some experimentation at those prices, but a 1000ft spool of fail could also be a result.